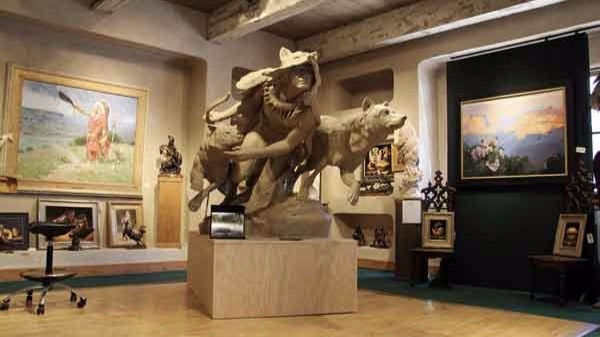 Representing the Fading History of the American West in Native American, Wildlife, and Western Bronze Sculpture. Throughout the month of May 2019, the Phippen Museum will offer the 16th presentation of our very successful Miniature Masterpiece Show & Sale. Show at Trailside Galleries in Jackson, WY. February 2019. Dustin’s newest work will be showcased during “Cowboy Country”, a show at Trailside Galleries in Jackson, Wyoming. Dustin started the new year with an exciting completion of his “Oliver Loving” Monument that is headed to Pueblo, Colorado this Spring. He finished up the sculpting and delivered it to the foundry, clearing out his studio space for new ideas and work for 2019. After coming home from the Cowboy Artists of America show, we were excited that all of Dusty’s work was sold at the show and he was honored with a silver medal award for his sculpture “The Midnight Storm”. The Cowboy Artists of America invite you to experience Cowboy Trails — the first, annual online-only exhibition and sale featuring artworks inspired by the 2018 CAA Trail Ride. Dustin’s work has been shipped out to the Summer Stampede show in Lubbock, TX. This is the first time we have sent artwork to this show at the National Ranching & Heritage Center, should be a great time! We respect our collectors privacy. Please be assured that we will keep your information private. Thank you for your interest.